A Pfalz D.VIII on display in the Legend, Memory and the Great War In The Air gallery at the National Mall building. The German Pfalz D.XII appeared on the western front in the summer of 1918. It climbed satisfactorily and its performance in level flight was comparable to that of the famous Fokker D.VII. But it could not turn as well and it was sluggish in combat. The German Pfalz D.XII appeared on the western front in the summer of 1918. It climbed satisfactorily and its performance in level flight was comparable to that of the famous Fokker D.VII. But it could not turn as well and it was sluggish in combat. Despite these limitations, the Pfalz D.XII performed well enough to relieve the German Air Service of its shortage of competitive fighters late in the war. By the time of the Armistice, nearly 800 D.XIIs had been delivered to front-line service. The wartime history of the NASM Pfalz D.XII is obscure. After the war, it came to the United States as part of Allied war reparations. It was later sold as war surplus, brought to Hollywood, and appeared in a number of World War I aviation films. Given the lack of information on this particular airplane's wartime history, and its well-documented and illustrious movie career, NASM decided to restore the Pfalz as it appeared in the 1930 Hollywood aviation classic, Dawn Patrol. The Pfalz D.XII first appeared on the western front in the First World War shortly after the June 1918 fighter trials held at Adlershof, Germany, where a number of aircraft were accepted for production by Idflieg (Inspektion der Fliegertruppen). It was built as a replacement for the outdated Albatros and Pfalz D.III scouts and the outclassed Fokker Dr.I triplane. The Pfalz D.XII was a single-seat, two-bay biplane fighter of all-wood construction with a semi-monocoque plywood fuselage. It carried two forward-firing Maxim machine guns synchronized to fire through the propeller arc. The airplane was powered by a six-cylinder, 180-horsepower, water-cooled, in-line Mercedes D.IIIa engine. It had a top speed of 170 kph (106 mph) and a ceiling of 5,640 m (18,500 ft). The Pfalz D.XII climbed satisfactorily and its performance in level flight was comparable to that of the Fokker D.VII. Because of its sturdy construction, it could dive faster and steeper than the D.VII, but it could not turn as well and was sluggish in combat. Furthermore, it tended to "float" when landing, and many accidents occurred because of the weakness of the landing gear. Despite these problems, the Pfalz D.XII performed well enough to relieve the German Air Service of its shortage of competitive fighters late in the war. By the time of the Armistice, nearly 800 aircraft had been delivered to front-line service. After the war a substantial number were turned over to the Allies, perhaps as many as 175. Four of those aircraft survive. One is on display at the Musée de l'Air in Paris, another is in the Australian War Memorial in Canberra. The two other examples are former Hollywood movie performers. One of these resides at the Champlin Fighter Museum in Mesa, Arizona, and the other at NASM. The wartime history of the NASM Pfalz D.XII is obscure. A contemporary document from the U.S. Air Service, entitled "Reports of Inspection of (Captured) German Airplanes," refers to two Pfalz D.XIIs that were inspected at Coblenz on January 1, 1919. According to a 1949 letter from Louis C. "Buck" Kennell, the donor of the NASM airplane, these two Pfalz aircraft were brought to this country as part of Allied war reparations. Kennell also related that these airplanes were then sold as war surplus, brought to Hollywood, and appeared in the 1930 Howard Hughes epic, Hell's Angels, and the first Dawn Patrol film, also made in 1930. Kennell's assertion that the airplanes appeared in Hell's Angels is probably true, but remains unconfirmed. After their use in Dawn Patrol, the two aircraft were sent to a Hollywood back lot for storage. Most of the existing film footage of the Pfalz comes from this movie, and there are several stills of the NASM aircraft from the film. One Pfalz was purchased in 1936 by Col. G.B. Jarrett. Frank Tallman owned it next, and after his death it was auctioned off as part of the Wings and Wheels aeronautical collection in Orlando, Florida. It was purchased by Doug Champlin, and is now part of the Champlin Fighter Museum collection. The other airplane remained on the Hollywood back lot until 1938, when it was acquired by Buck Kennell, a Paramount Pictures property manager and electrician. Kennell restored the aircraft for use in the 1938 motion picture Men with Wings. It is not clear if the airplane appeared in the film, however. The Smithsonian Institution received the Pfalz D.XII from Kennell in 1951. It remained in storage until 1963, when it was sent to the Experimental Aircraft Association Museum to be restored. It was painted in typical wartime colors and markings for a Pfalz D.XII, although no information exists on precisely how the NASM Pfalz appeared during the war. 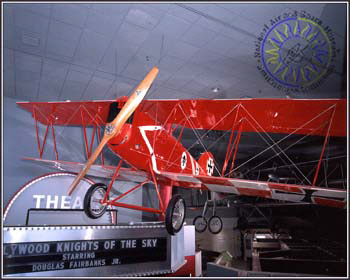 In 1989 NASM decided to use the Pfalz D.XII in the new exhibition on World War I aviation entitled Legend, Memory, and the Great War in the Air. In view of the lack of information on this particular airplane's wartime history, and its well-documented and illustrious movie career, it was decided to refurbish the Pfalz as it appeared in the Hollywood classic Dawn Patrol. 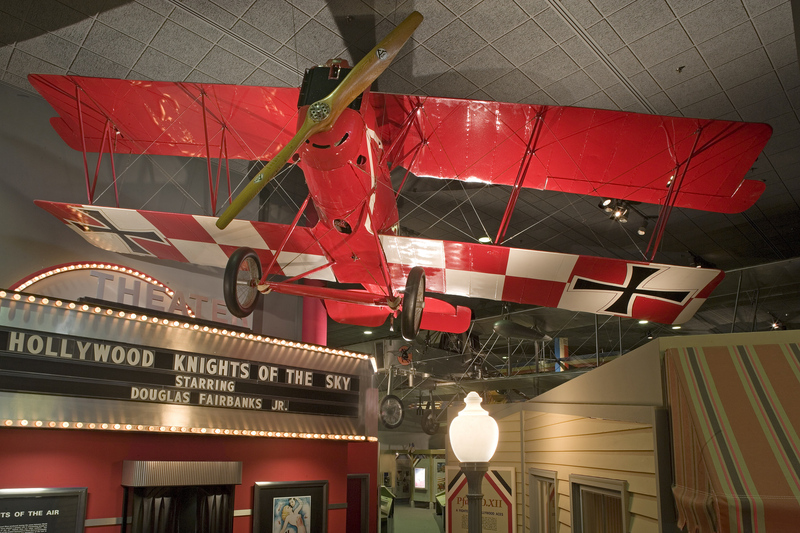 The airplane is the feature artifact in the section of the exhibition that treats the famous Hollywood aviation films of the 1930s. Gift of Louis C. Kennell and Vina Kennell. Single-engine, single-seat, German World War I biplane fighter; 180-horsepower Mercedes D.IIIa water-cooled engine. Painted red and white as it appeared in 1930 film, "Dawn Patrol."